Racing games are an interesting breed, particularly when you look at the fringes of the genre. These are games that stand out because they add onto the racing, giving you something new that complements the racing or changes it somehow. GRIP: Combat Racing is certainly a part of this. The question is how is it different, and just how good of a job does it do? Kart racers, such as Mario Kart and the outstanding Nickelodeon Kart Racers give you an easy to access, colourful, family-friendly game where you go around a course, collecting pickups and spectacularly griefing an opponent as they get close to the finish line. 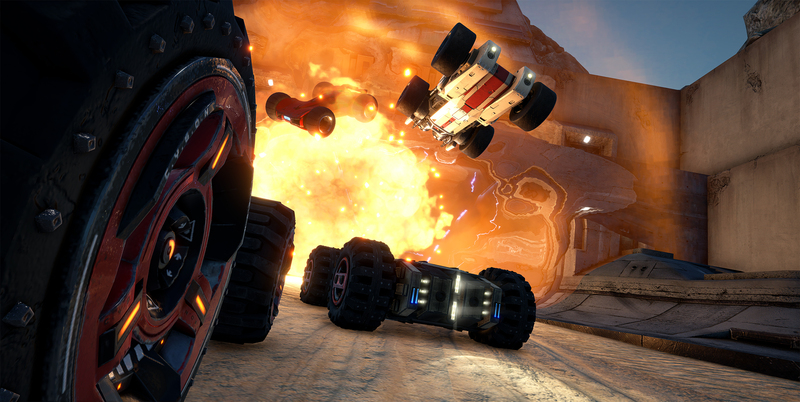 You’ve also got some fantastic vehicular combat titles like Destruction Derby, Carmageddon and Twisted Metal. Make sure you don’t forget futuristic racers like WipEout, a game that certainly inspired GRIP. GRIP is the spiritual successor to Rollcage (think WipEout on wheels) which was developed by industry legends Psygnosis (WipEout and the completely unrelated, but great, Colony Wars). GRIP also has a veteran of Rollcage involved in the development of the game and is a merging, of sorts, of all of the previously mentioned types of racing games. So how exactly is GRIP a merging of these multiple types? In a few ways. Much like WipEout, this has you racing around tracks at an insane speed, moving on tracks so twisty that it’s easy to get confused. On these tracks that you speed around are pickups, these pickups will offer a variety of weapons, defensive items and other support tools. All of these are incredibly useful in helping you win a hard-fought race. The variety of these pickups are much as you would expect. From a gun that will spin-out any opponent, it hits to a homing missile that will totally ruin their day. Naturally, you’re at risk from these exact same weapons. Your options are limited. Hopefully, you’ve picked up a shield boost or one that will give you a huge speed increase and let you outrun the opposition, though that isn’t always guaranteed. As well as pickups, you also have a natural boost meter that regenerates itself and you can use whenever you like. The amount this boost regenerates does, however, depend on your position in the race. You’re in last? Well, at least the boost will regenerate much quicker in a way to let you try to pull yourself back into the race. Or, maybe not even a race. GRIP features a variety of game modes to try out. These include your standard races but also battle arenas and ultimate races (think Death Race). The game even has it’s own parkour style challenges, naturally called Carkour, where you’ll challenge yourself to some downright brutal courses. If you’re anything like me, you won’t find yourself winning much on these. It’s with this variety of game modes that one of GRIP’s best features comes into it: the tracks. Working with the variety of races and modes are a host of maps, each with their own style that fits in with the whole dystopian Max Max or Death Race feel the game has going. Either you’re racing through a huge city with a swathe of billboards and no other life around, or you’re in the ruins of formerly built-up areas which have been left to ruin. These make for the best tracks as the views are great and there’s just a larger sense of freedom. As for the cities, I want to meet the architect who designed roads at some absurd angles, because no regular car can stick to them. Whatever he (or she) was drinking, I want it. This is the real selling point of the game. The cars have small chassis with absurdly huge wheels. Combine this with the insane speed and you have a car that can ride any surface, gravity be damned. This allows for a strong sense of verticality and adds a completely new dimension to the race. Well, it should anyway. The problem is that for the most part, this doesn’t really get used to great effect. A wide number of tracks will often have a diverging path here and there. Only on occasion will you find that you’re literally driving on one surface with an opponent parallel to you. A well-placed jump and your roofs could collide. 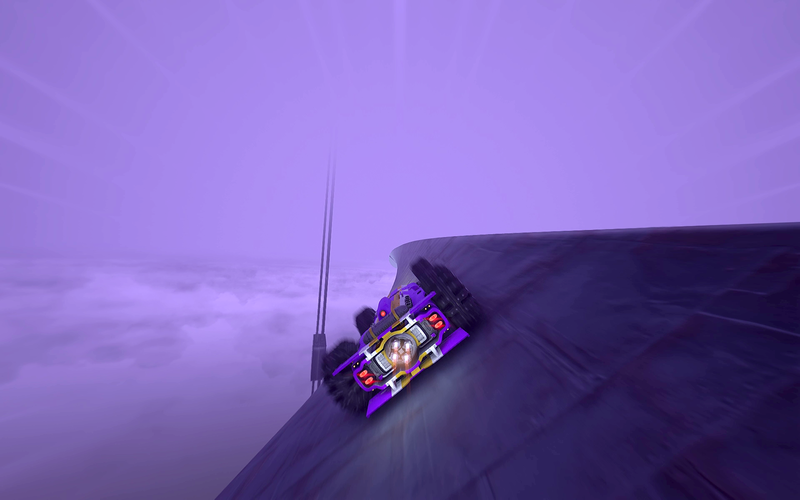 I can’t truly say it’s a problem with the game, more with myself, but the only issue I had is that I’d find myself getting lost in the spirals, the walls, completely losing up, down, left or right until I came crashing down off of the edge of the track. What does help is that GRIP looks and sounds great. Even when I’m getting confused by the topsy-turvy nature of the tracks, my vehicle going upside down, I never stop finding myself admiring the scenery. Particularly so with wide open tracks that snake through the wilderness, often with remnants of humanity for you to snake through or, more appropriately, drive up. The cars are equally well detailed, with a wide amount of customisation at your disposal for both visual and functional parts. All of it can be unlocked in-game too, meaning you’re not going to find yourself being fleeced for extra content. It’s all an ideal system that does help raise the game to another level, particularly as you can use these customised vehicles in the much-fairer and non-rubberbanding online mode. Unless you count the faster regenerating boost, but I don’t see it as that much of a game changer. Skill actually matters. It’s all combined with a very strong soundtrack. While I can’t say that the music is exactly my genre, I can’t help but feel that it’s perfect for getting you into the mood for some insane, fast-paced, explodey action. GRIP is a solid and functional game with a significant amount of content. It also looks great and offers a decent spectacle, here and there. With a host of cars that can be upgraded in a number of ways, all racing around on a wide variety of tracks full of collectibles to boost or defend yourself, or to attack an enemy. It can all make for an exciting time. Sometimes, that is, because I honestly feel it’s missed the mark at times. Particularly so with the arena based modes. It’s technically sound but altogether a little boring and unfair. All too often have I found myself suffering from the rubberbanding of the opposition to then have a rocket fired up my arse, costing me the race. Personal skill doesn’t seem to be a factor, though maybe racing tactically and not staying in the lead is the best option. I can genuinely see others enjoying GRIP more than I have. PS4 version reviewed. Copy provided by the publisher. You can purchase the game for consoles (PlayStation 4, Nintendo Switch, Xbox One) via Amazon or for PC via Green Man Gaming. GRIP is a technically sound game and can genuinely offer some exciting racing, as you try to dodge enemy weapons, track hazards and more, all at insane speeds. However, it can also be a confusing game to navigate and also has very unfair rubber-banding which can screw you over more than half the time as you'll find a well-placed rocket right up your rear-pipe just before you hit the finish line. GRIP also looks and sounds great, with some very well designed tracks, though some side modes (arena-based modes) completely miss out the best part about the game - being able to ride on any surface. I can genuinely see people enjoying their time with GRIP than I have, I just think it's missed the mark.